An Exciting New Update Expands Soul Arms! The 3D fantasy MMORPG League of Angels II continues to reinvigorate the browser game genre! As the mighty Soul Arms sweep over the Sapphire, the newest game update expands this system even further and brings all new customization options. Now players can enhance the skills of their Soul Arms to gain the ultimate power! Through Skill Enhance, players can boost the effects of Soul Arm skills, such as increase damage, enhance buffs, and even add new effects! Access: Open the Soul Arms panel and select the “Enhance” tab. Each Soul Arm has 3 different branches that can be enhanced, and each provides a different effect bonus to the Soul Arm skill. As you can see, these 3 branches enhance the skill in different aspects. Players can choose one or more of them to enhance. Players need to first select the branch that they want, and then click “Enhance” button to enhance. For more detail about Skill Enhance, players can consult “Enhance Guide” in the Enhance panel. Enhancing Skill to R1 will require Soul Arm Shards and the new Leaf of Life item. Enhancing to R2 and above will also require the new Crimson Gem item. Both Leaf of Life and Crimson Gems can be found in the Ore Shop. 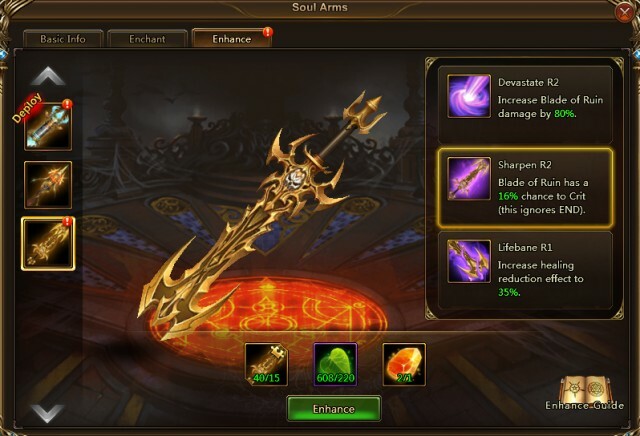 Are you itching to unleash the true power of your Soul Arms with the new Skill Enhance feature? Join millions of players around the world and play LoA2 now for free!